Eddie “Brother Ed” Wille, Jr. passed away on June 26th after, as his obituary says, kicking cancer in the balls for two years. Anyone who was involved in the Cleveland area film and music scene knew Ed as one of the nicest guys around. 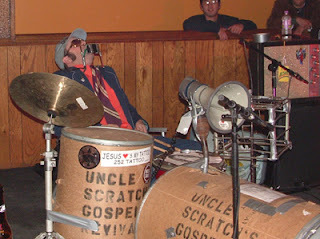 He played in numerous bands over the years, including Hucklebuck and Hellvis. Most recently he played drums and preached/sang for Uncle Scratch's Gospel Revival. As a member of that garage rock duo, he appeared in three films for area producer/director Joe Ostrica: THE HORROR CONVENTION MASSACRE, THE HORROR CONVENTION MASSACRE 2, and THE SPOOKSHOW. Ed also played the role of “Froggie” on the Ghoul Show when it returned to Cleveland's airwaves in the late nineties on Channel 55. Perhaps one of Ed's most important contributions to the local film scene was as co-owner and proprietor with his wife Natalie of B-Ware Video. In a time before everything could be had with the click of a mouse on the internet, Ed's store was the only place to find rare and obscure cult, horror, and exploitation movies from the likes of Russ Meyer, David Friedman, and Kenneth Anger. I lived in Akron at the time, and nonetheless would drive for close to an hour just to rent films from B-Ware. It was worth the time and money for gas just to be able to see these films. Ed will be missed greatly by all who knew him. He is survived by his wife Natalie and his son Angus. Ed was in a class by himself. He and Natalie told me that when B-Ware bought the entire Russ Meyer collection as a rental he got a personal call from Meyer's people (Meyer self-distributed) in gratitude. Maybe Meyer is thanking Ed in person now.